Ever wanted to run a unix like command line interface online? Well, Goosh did it. 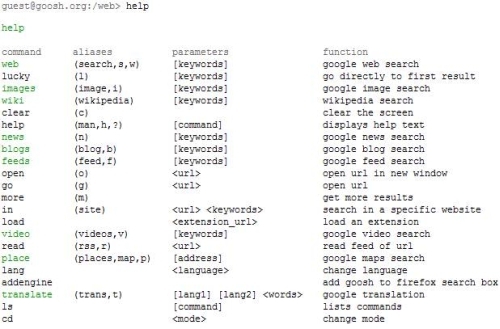 Powered by Google, Goosh behaves similar to a unix-shell, allows you to run “Google Commands” and the results will be shown on the page. Goosh offers you some custom commands that you can run against Google. Just type “help” at the prompt and you will be preseneted with a list of commands that you can use plus the parameters that these commands can accpet. Pretty neat, simple and feels like Unix I should say. 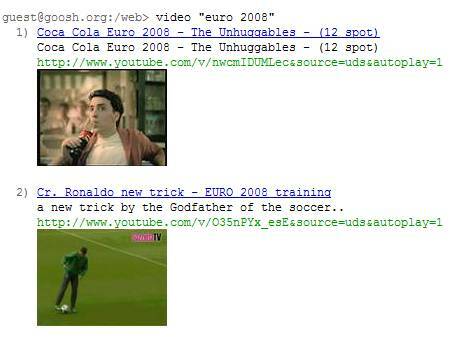 For example, I did a video search for “euro 2008” and got back the following video results. Apart from the web, feed and video search from Google, there’s even wikipedia! I will try this tips and I prefer to my friends and family. Good tips. Thanks.